The Duke Company rents state-of-the-art floor sweepers and scrubbers that will greatly increases the productivity of your construction team and keep your job site clean. Our stand-on floor sweeper rental equipment offers +50% labor savings vs. walk-behind floor sweepers. Notably, the Duke Company’s floor scrubber equipment is impressively quiet at 66.9 decibels, and is expertly crafted to pick-up 100% of water that is dispersed. Manufactured by a commercial floor scrubber leader, Windsor Commercial Cleaning Equipment is engineered for daily use and has exceptional cleaning ability for both carpets and floors. 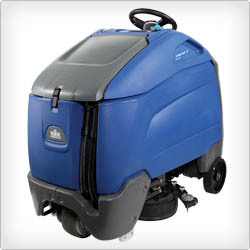 Windsor commercial cleaning equipment is noted for exceptional quality and durability.